Go on, admit it. You’ve fantasised about your specific choice of bike for a zombie apocalypse. Naturally you can have anything you want, as you’ll be throwing a brick through the front window of the local deal once the social chaos really takes hold. So what’ll it be? A BMW R1200GS? You’d be able to carry a house on the back, but its weight and size would make avoiding the undead (and keeping it upright) tricky. Then maybe a KTM Enduro bike? You’d be much more nimble and need less fuel, but what about a seat for the loved ones? Who knew a completely hypothetical situation could be so stressful? But don’t fear, as we have the perfect candidate. 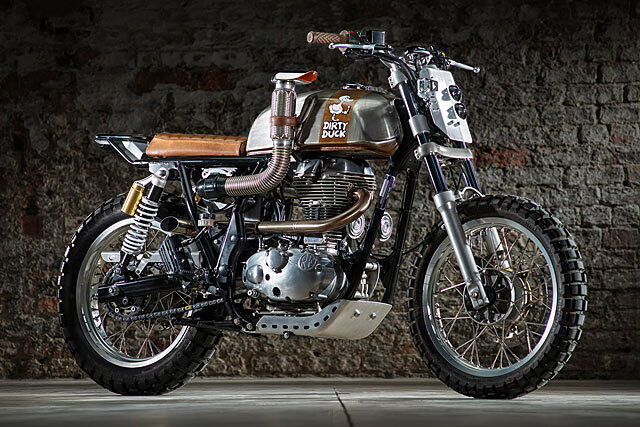 Meet Royal Enfield’s very own Continental GT survivalist masterstroke. 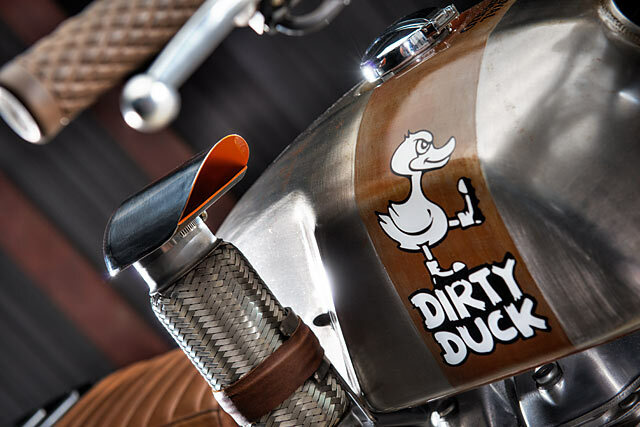 They call it the ‘Dirty Duck’. We call it ‘escape plan A’. “We wanted to make the motorcycle version of that,” says Subbu. 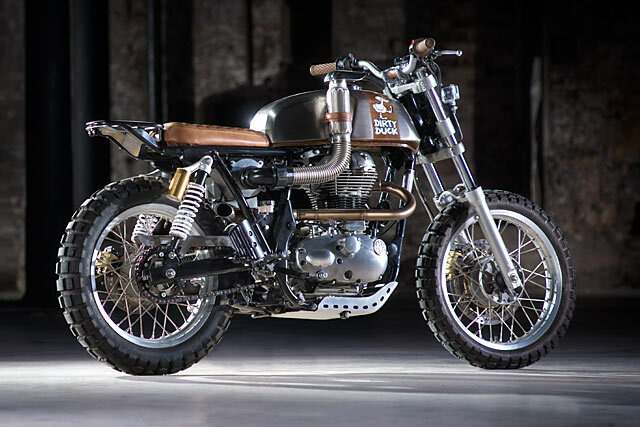 “The already angular forms of the tank and frame worked perfectly for conveying this idea of utilitarian toughness.” The addition of a hand-fabricated snorkel from Harris Performance completes the look. 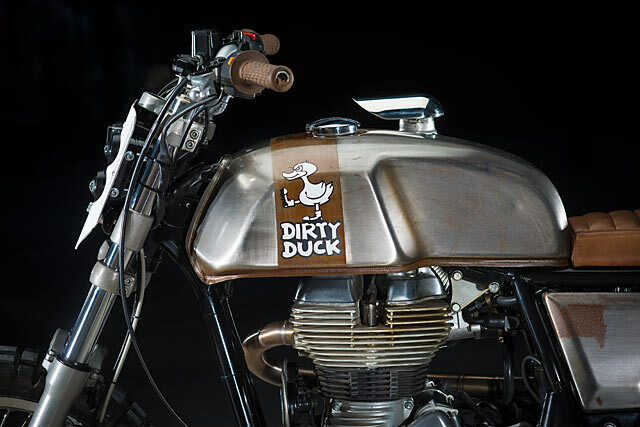 “Hence the name ‘Dirty Duck’ – it’s a bike that can go anywhere on land or water,” he notes. Let’s just hope there’s a guard on the snorkel to prevent it ingesting rotten intestines. Damn those undead bastards. 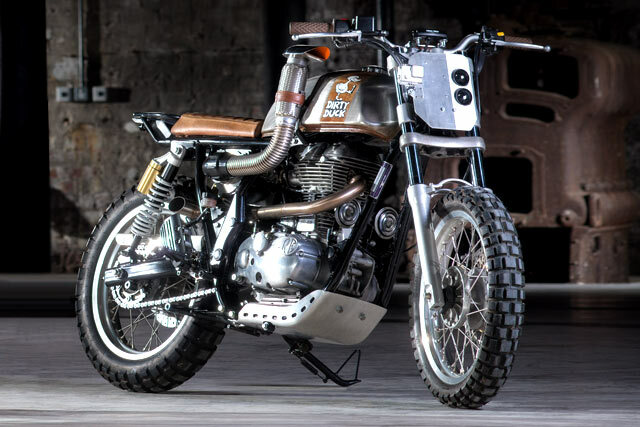 To be perfectly clear about this Enfield’s off-road intentions, Continental TKC80 tires – the biggest and blockiest you can find – were added on to the stock rims. The frame was then shortened at the rear to accommodate a rack for all your rations and weapons of choice, and the hand-made seat was wrapped in oiled leather. It will only get more beautiful as it ages and/or is sprayed with blood. 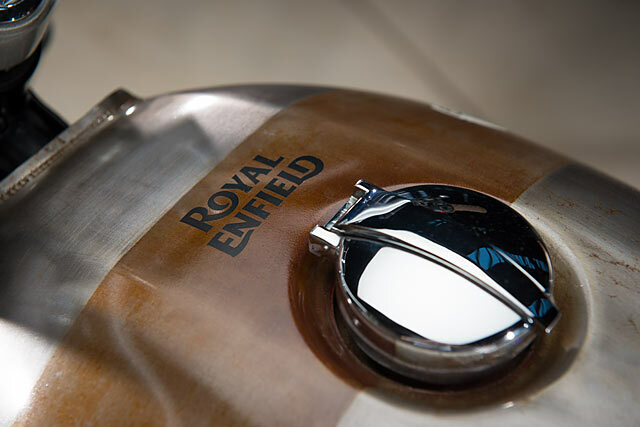 “The same is true of the tank, which has been naturally rusted to show off its history of surviving adventures and at the same time make it clear that you really shouldn’t feel bad about dropping or using the Dirty Duck to its absolute fullest,” notes Subbu. The airbox has been modified (again by Harris Performance) to allow the passage of the straight-through exhaust. And by straight through, we mean no baffles of any kind. At all. Apparently, it sounds like a bike several times its actual zombie killing power. 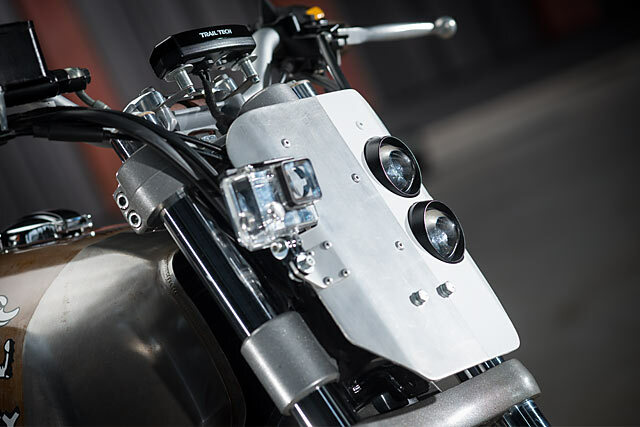 The finishing touches on the scrambler include an aluminum sump-guard that protects the motor and frame from damage by bone fragments and adds perfectly to the overall impression of end-of-the-world durability.